Have you ever wondered what role the queen really plays within the hive? She certainly plays a vital role, but what exactly is that role? Let’s look at the life of a queen, from the beginning of her life to the very end. The queen, of course, is pivotal to everything that happens within a healthy bee hive. With some exceptions, she is the only queen in a colony of honey bees that may number 60,000 or more. The clear majority of the other bees are working to support her egg-laying productivity. While much of their work is not directly related to egg-laying, it all contributes to the ongoing survival of the colony. For example, workers will build huge stores of honey over the spring and summer. These reserves support the survival of the colony through the winter, after which the queen will start laying again. As a beekeeper, it is important to understand the role of the queen and her interaction with workers and drones. This will help you assess the health of the colony on an ongoing basis and troubleshoot when issues occur. Despite beekeeping being a mature and long-standing tradition, scientists are still trying to understand the fine details of the queen’s life and so beekeeping is never dull! The queen is very directed and regimented in everything she does, from her mating flight to her regular, consistent egg-laying prowess. Given her central role and even her name, it is understandable that the layman assumes the queen to be a decision-maker, of sorts. This is not the case at all. She is the star of the hive, because of her egg-laying abilities, but is controlled by a an overall puppet master – the collection of worker bees. Worker bees have the ability to raise a new queen – or kill an existing one – whenever they wish. The queen is only in control of laying eggs and when she will lay, though her use of pheromones is a key signal for the colony. Queen cups are wax dome-shaped cups intended to contain an egg for a future queen. Beekeepers should be on the lookout for queen cups during hive inspections, as they send an important message, potentially signaling imminent swarm intentions. If you see queen cups with an egg, white liquid and where the comb has been drawn out to form a queen cell, then you should pay attention. This queen cup has been “acknowledged” and is in the process of being developing into a future queen, a sign of potential swarming. Once a queen cup has been developed and an egg is present, nurse bees will begin drawing out comb to about 25 millimeters in length, to give the larvae room to grow. The cell will be covered with a layer of wax around day 9, and it will take about 16 days for the queen to hatch. Workers will feed her royal jelly, beyond the three days of royal jelly received by worker and drone larvae. The queen is the only caste fed this secreted substance throughout her larvae phase. After 16 days, the queen will begin to chew her way out of the queen cup, gnawing through the wax cap. As her head begins to poke through, workers will help her chew her way out. Anatomy, Including a Reusable Stinger! The queen is the largest bee in the colony. Her wings only make it half way down her abdomen, whereas the other bees have wings fully covering the abdomen. A queen honey bee is around 20 mm in size. Her most important anatomical characteristics are her female reproductive organs, such as the spermatheca. This is where she stores the sperm she collects during her mating flights. She will use this sperm for the rest of her life to lay fertilized eggs, which produce female bees. The queen’s stinger is very smooth in comparison to the worker bee’s stinger, which is barbed. Unlike workers, she can sting multiple times and survive. Her stinger is also used during the process of laying eggs, positioning eggs and to fight other queens. Generally, though, queens are docile and rarely sting beekeepers. A queen is reasonably easy to spot within a hive, assuming you pull out the frame on which she rests. Although beekeepers become more effective at spotting the queen over time, it is quite common to “mark” the queen. This is a small dot placed on her thorax, which helps her leap out visually when searching. Beekeepers use a consistent color for any one year, so it’s easy to tell the year she was born. Marking a queen often costs an extra $5 – $10 but is well worth the cost. Whether a new beekeeper or experienced, if you are buying your bees consider asking for the queen to be marked. It doesn’t harm the queen and helps you locate her just a little bit quicker. Along with about half of the colony, she will take off from the hive, collectively forming the swarm, to a temporary location as they look for a new home. In effect, the colony has just reproduced and the queen has left the original hive forever. It is worth noting an important aspect of this process. The colony decides when to prepare new queen and the colony stops feeding the existing queen, so she can fly. In essence, the colony as a whole – made up primarily of workers – decide when to swarm and the fate of the queen. After the swarm has left, new queens cells will start to hatch. The first queen to hatch will make a choice. She can remain in the hive and become the new queen or she can take some of the bees with her and swarm. Remaining in the hive is the more common decision, in which case her first task is indicative of the tough life in the hive. For a new queen remaining in the hive, her first step is to search for yet-to-be-born sister queens. She will use her stinger to kill them in their cells, thus ensuring she is the only queen in the colony. To implant her deadly stinger, the queen will need to chew through the wax capping of her sister’s cell and worker bees will help her do that, ready for the kill! What happens if the queen has a sister? If two queens happen to hatch around the same time they will fight until one of them dies. The one that survives is the new queen. 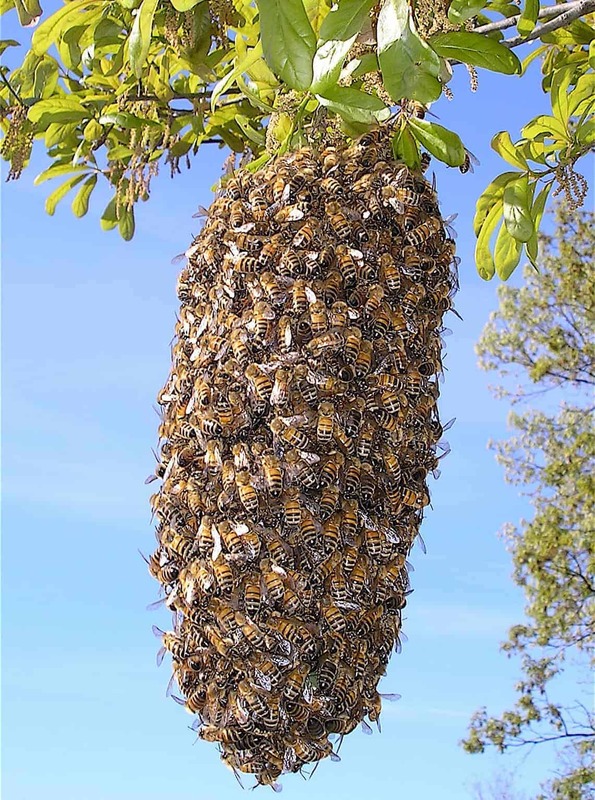 In some situations, a newly born queen may also swarm, just like the “prime” (first) swarm. This means that soon after birth she will fly off to pastures new, with yet more bees from the colony. This second swarm – after the prime swarm – is called an after swarm. 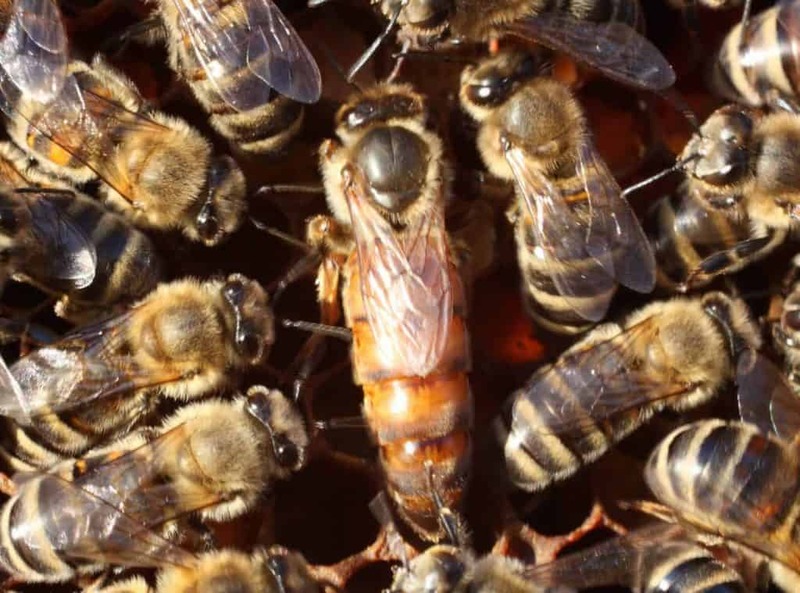 Subsequently, the next queen may be born and go through the same process – stay or swarm. Potentially, a number of after swarms may result in the colony being completely decimated, though this is rare. The queen will go on mating flights shortly after birth. She will attract drones in a “drone congregating area” and mate with approximately 10-20 different drones. A drone who mates with the queen will die during the process because his appendage will be ripped from his body during the process. Back in the hive, the queen will commence her life as an egg-layer, laying around 2,000 eggs per day. Fertilized eggs will be workers or queens and unfertilized eggs will be drones. A queen’s DNA has 32 chromosomes, as is the case with all female bees. Females receive 16 chromosomes from the queen from which they were born and 16 from the drone that provided the sperm. The queen mates with many drones so she can be assured of genetic diversity in the colony. Requeening is when a queen is replaced, due to the death of the original queen, poor genetics or simply because she has become unproductive. It is recommended that the new queen is from a different genetic line, to give your colony a greater chance of survival. This will help with productivity and queen disposition as well. The queen gives off a queen pheromone. This sends a message to the workers about her health and productivity. When workers can no longer smell the pheromone at a sufficient “per bee” concentration they know it is time to raise a new queen, because there are too many bees for the one queen. The workers take care of the queen, feeding and grooming her. The queen depends heavily upon the rest of the colony, because she can’t even digest her own food. Workers must digest it for her and then feed it to her. They also clean up her waste after her. Where is your ‘dependably studied’ colony located?